The Troll Wall (centre). Store Trolltind is the highest point along the ridge. 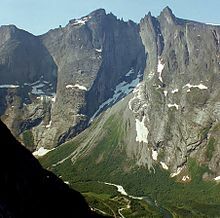 The Troll Wall was first climbed in 1965 by a Norwegian team. The Norwegian team, consisting of Ole Daniel Enersen, Leif Norman Patterson, Odd Eliassen, and Jon Teigland, finished one day ahead of the British climbers Tony Howard, John Amatt and Bill Tweedale, who established the most popular climbing route on the wall, the Rimmon Route. As of 2003, this route was reported unclimbable because a rockfall in September 1998 destroyed five of its pitches. The wall saw its first winter ascent in March 1974, when Wojciech Kurtyka from Poland spent 13 days repeating the 1967 French Route. In 1979, the wall was free climbed for the first time by local climber Hans Christian Doseth and Ragnhild Amundsen. Today, there are many routes on the wall, ranging in length and difficulty. The classic Rimmon and Swedish routes were normally free climbed in a day or two until being heavily damaged by the 1998 rock falls. The longer and more engaging aid routes, such as the 1972 test piece Arch Wall (climbed by Ed and Hugh Drummond in 20 days), or the 1986 Death to All/Pretty Blond Vikings, which cuts through the steepest part of the wall, require advanced knowledge of big wall climbing and several days on the wall. Due to the serious character of the wall, in addition to a cold and damp climate, new routes on Troll Wall are rare. In February 2002, a Russian team established the Krasnoyarsk Route during 19 days. The 1,200 metres (3,900 ft) long Krasnoyarsk, graded f6c+/A4+, is generally thought to be the hardest aid route on the wall and was awarded first prize in the 2002 All Russia Winter Mountaineering Championships. In July 2010, Arch Wall, previously a serious aid route of difficulty up to A4+, saw its first all-free ascent by local climber Sindre Sæther and his father, Ole Johan. Arch Wall is about 1,200 metres (3,900 ft) of climbing over 37 pitches, and it took the two a total of 36 hours of climbing to reach the summit. In July 2012, Sindre and Ole Johan Sæther repeated the feat by free climbing the Krasnoyarsk Route. The most recent contribution to climbs on the Troll Wall is Katharsis, established by Polish climbers Marek Raganowicz and Marcin Tomaszewski over 18 days in January and February 2015. According to Planetmountain.com, the new route shares the first two pitches of the French Route, before forging a line between the Russian Route and Arch Wall. The team reported of difficulties up to A4/M7. On 11-26 January 2017 Polish climber Marek Raganowicz made the first solo ascents wall in winter. In 1980 a new sport debuted when the Finn Jorma Öster made the first parachute jump from the Troll Wall and it was one of the pioneering sites for European base jumping during the first half of the 1980s. However, after a number of fatalities, the Norwegian authorities made base jumping from the Troll Wall illegal on July 25, 1986. Eight base jumpers are known to have lost their lives at the Troll Wall. The first recorded fatality was Carl Boenish in 1984 while the most recent was in 2012. In February 2018, Spanish ski mountaineer Kilian Jornet (resident nearby) was the first to ski down near the Troll Wall, using the Fiva route. ^ Store norske leksikon. "Trollveggen" (in Norwegian). Retrieved 2010-10-27. ^ a b c "TROLLVEGGEN", alpinist.com, 1 September 2003. Retrieved 18 January 2011. ^ Troll Wall: the Untold Story of the British First Ascent of Europe's Tallest Rock Face Archived 2011-02-21 at the Wayback Machine, v-publishing.co.uk. Retrieved 18 January 2011. ^ "Base Hopper died after crashing in the rock wall", vg.no, 18 July 2003. Retrieved 18 July 2012. Nebell, Anne Grete; Bø, Bjarte (1999). Klatring i Romsdal (in Norwegian). Sogge Fjellsport. ISBN 978-82-995032-0-4. Wikimedia Commons has media related to Trollveggen.